Your forwarded email of 3rd April, 2012 sent to us and 186 recipients on the banning of hijab in New Zealand refers. In = spirit of brotherhood we use this opportunity to respectfully offer our advice and pray that you do not take any umbrage. We have sought and received confirmation from the New Zealand High Commission in Pretoria that 'the New Zealand government is not running a poll on the subject of banning of the Hijab.' They also informed us that the poll was originally run by the Internet site Yahoo two years ago when the issue was a hot topic in other parts of the world. Furthermore, our counterparts in New Zealand rejected this allegation and expressed surprise that such a rumour was circulating in South Africa. The medium of email, whilst a boon to swift communication worldwide at the click of a mouse also has the potential to do great harm by rampantly fuelling the rumour mill. The Hadith of Rasulullah sallallahu alayhi wa sallam also records very clearly the advice in these matters. Al-Imaam Muslim narrated that Hafs ibn ?Asim said: "Rasulullah sallallahu alayhi wa sallam said: ?it is sufficient for a person to be called a liar if he conveys all that he hears". In light of the Quranic injunction and Prophetic teaching, it is one's duty to verify information before merely forwarding it and thereby becoming a link in the rumour chain. "Clarify before you amplify" should be the golden rule. 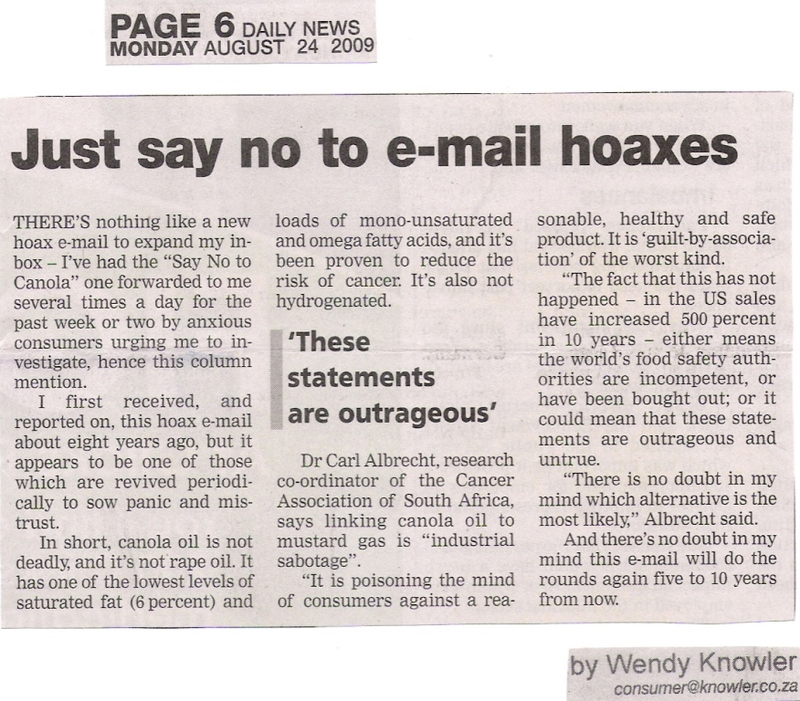 We also attach herewith an article by the award winning and respected consumer columnist of the Daily News from the city of Durban, Wendy Knowler who has spoken out on hoax e-mails. In this particular article she refers to the rumour that she first encountered eight years ago which is still doing the rounds. We pray that you will notify those to whom you circulated the rumour and take preventative steps in the future. The gov't of New Zealand is running an online POLL on Yahoo to know our opinion about banning HIJAB in their country. Please let's help our sisters in New Zealand by voting "NO". please do not ignore, VOTE and SEND to as many muslims as you can.